Great for temporary and new employees, title changes, temporary assignments, raffle tickets, appointment cards, coupons and more! 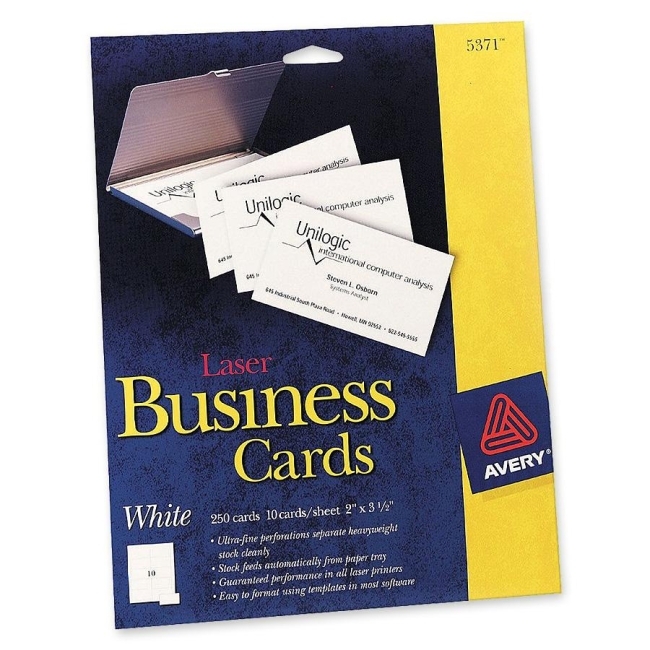 Media Size: A8 2" x 3.50"
Create professional-looking business cards using your laser printer. Ideal for everyday use or for times when you need to make title or address changes, cards for new employees, or customized messages. Ultra-fine perforations allow you to separate cards easily and cleanly. 8-1/2" x 11" heavyweight cardstock sheets feed automatically from paper tray. Heavyweight cardstock provides vivid colors and sharp text. 2" x 3-1/2" cards are printable on both front and back side of cards. Avery offers many easy-to-use templates for Microsoft Word and other popular software programs. Heavyweight cardstock sheets feed automatically from the paper tray. Ultra-fine perforations separate cleanly and easily.